Whilst living in a foreign country, one of the main causes for concern is hygiene and safety. Over the last few weeks I have noticed various instances where there has been a discrepancy in Western ideas of health, safety and wellbeing and those of the Cambodians. Needless to say, some of them have resulted in hair-raising hilarity (you’ll appreciate that pun more later). 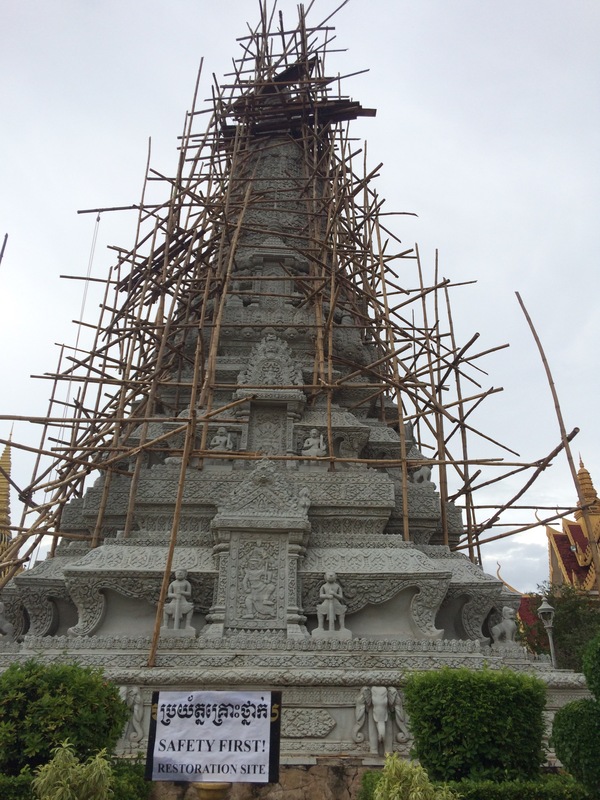 First, I saw a sign at the Royal Palace which stated “Safety First!” This was below some bamboo and wood scaffolding surrounding a stupa that was being restored. The scaffold was tied together in places with what appeared to be gardener’s twine. It looked to me as if some giants had commenced a game of pick-up sticks and not like a structure to allow safe and ready access to a 30ft high monument. Another difference between Cambodia and the U.K. is the popularity of massages. Although massages are available in Britain, it is not to the same extent as in Cambodia. As we have already ascertained I am a caricature of an anxious Brit, and this include my dislike of excessive physical contact with others – especially strangers. So, massages are generally out of the question. However, whilst at the mall, my housemate and I were somewhat intrigued by these space age contraptions that looked like they had been extracted from NASA’s latest shuttle. They were massage chairs that had slots for your arms and boots for your feet. I wouldn’t have been surprised had they taken off. So we asked if we could have a go. With some trepidation, I climbed into the red space throne. The sales lady took the control screen and moved it so I could not see what she was pressing. She turned and left, at which point the chair awoke into action. Now, if machines ever decide to take over the world, it’s not Arnold Schwarzenegger’s leather-bound robot you have to be running from, but these massage chairs. The first thing that happened was that the boots and arm slots inflated, trapping my limbs in the device. Not only was I incarcerated, but the sensation was pretty unpleasant. It’s the same nauseating compression as when your blood pressure is taken with a sphygmomanometer. The next stage is that the chair reclines, rendering you sky-facing and unaware of your surroundings. Once your immobility and disorientation is achieved, it really starts to go in a downward direction. And by downward, I mean down there. Within the seat, are mechanical balls that move, rotate and occasionally pummel, in an attempt to loosen your tight muscles and induce relaxation. They started at the neck and shoulder, then descended to the back, then lower back and then… Well, let’s just say the chair and I reached second base. (And I hadn’t even had a chance to ask its name.) Of course, I was mortified. The machine eventually stopped, the shackles deflated, but the seat did not right itself. I assume this is the opportunity for the massaged to wallow in self-loathing and regret. However, I wanted out. I grabbed the control panel but was faced with icons that hardly disclosed their intention (although I’m pretty sure that if I was unlucky enough the chair and I may have made it all the way to fourth). With much hesitation I pressed a button, the chair whirred and slowly inclined to upright. I sighed a sigh of relief. I looked over to my housemate, who was lying there, lifeless. Had the trauma caused him to faint? Did the evil machine managed to do away with him? The slowly his head turned towards me. I was incredulous. How could anyone in their right mind find a massage chair relaxing and pleasant? Who was this madman? After this experience I vowed never to have anything to do with massages again. There was another issue I had to address, and it took a great deal of personal resolve. The last time I had got my haircut was early July, ready for the school prom (teachers possibly get more into these things than the children- or at least I do). I’d meant to get it retrimmed before I came out, but I didn’t. It would have only delayed the inevitable though. As I was in Cambodia for a year, there would be a point where I would need a haircut. This is probably one of the things that has haunted me the most about moving abroad. However, the time came and I needed to take the plunge. There are fewer moments in everyday life when a breakdown in communication is best avoided than at the hairdressers. I have thankfully been blessed not to have been on the receiving end of such a mix-up. I have been still further blessed to witness my brother falling victim to such a plight. Either my brother failed to articulate his request fully or, more likely, his preferences were largely ignored. Needless to say, as the razor passed over the top of my brother’s head and his ashen face could do all but look on at the reflected horror before him, I fell, doubled-over, rendered immobile by my fits of laughter. Normally, any recollection of this event would bring mirth. However, it served as a reminder that these calamities could happen even when all those concerned were apparently lucid and native-born speakers of a mutual language. I, however, did not even have these usual safeguards guaranteed to me. For days previous, I had been haunted by visions of me emerging from the barbershop a Frankenstein-esque hybrid of a Hitler youth and Chairman Mao. I did what only a modern man in a desperate state would do: turn to google. Fortunately, it came up with a hairdressers with a high rating and they even said that all the barbers spoke English. It provided spa treatment, waxing, massages and, of course, the bog-standard trim. It also had no mention of, um, other services that may be associated with the service industry here. It was a reputable, well-reviewed barbershop. I was thrilled, if not still slightly nervous. I gave my tut tuk driver the address (which is on the other side of Phnom Pehn), and off we went. I hadn’t made an appointment, but that didn’t matter. I went for the wash and cut option (only because it was a closed question, to which I nodded). I was ushered into a back room by a young woman. There was what I’d call a bench and a sink, but it had a particular space-age vibe reminiscent of the massage chair in the mall. I reclined onto a towel, and my hair was washed, extremely thoroughly. And then it began: the massage. At first, it was just the scalp. This I could deal with, but I had a good amount of difficulty in keeping my face straight and not laughing. And when you know you shouldn’t laugh, it becomes all the more difficult not to laugh. My forehead, hairline and temples were all very well rubbed. Then, the young woman sat me up. I thought it was finished, but oh no. I had to endure the shoulder rub. And then the karate chops to the back. I felt a mix of emotions: the mortification that I can’t go anywhere without getting a massage and the sense of hilarity that a guy who hated massages has just moved to a country where I can’t go anywhere without getting a massage. (I have even received a massage from one of my language tutors. “Learning Khmer you must find hard. You are very tense.” No, I’m very tense because someone is touching me.) I was there trying to fight the urge to either flee or to laugh. Fortunately, the massage got no lower than the shoulder blades. “Yep, grade four, then trim,” I gulped. He quickly and effeciently did the job. And it looked fine. In fact, it was a pretty decent haircut. And it was at least half the price you would pay in the UK for just a cut (no awkward massage thrown in). Of course, I have to find a place in Siem Reap that offers similar services (but I could take or leave the massage); it’d be implausable to come to Phnom Pehn everytime I needed a haircut. (Or would it?) You never know, you might get lucky, I could go to a barbershop and it could go terribly, terribly wrong. ‹ PreviousMessage for colleagues and students! This made me laugh, somewhat because I can relate to the unpleasantness of massage the first time. I never used to like massages, until recently. I realise, the first time is always the most painful/ unpleasant experience because your body is so tense. It gets better the more (frequent) you do it. I just don’t like people touching me!